Hey y’all! Just a quick late night update before the week-end activities begin! As you know, I have been championing a great cause by raising funds and awareness for Crohn’s and Colitis Foundation of America and running in the Kona Half Marathon on June 24. So far, with the support of my friends, family and community, I have raised almost $6500 for this charity. Woohoo! Tamo, my very special honoree, who is on the road to recovery from Colitis, has graciously organized a music and fashion benefit event tomorrow evening (June 7th) at Project One Gallery in San Francisco called FASHION ON THE RUN! There will be a trunk show of local designers including Tamo Design, Silver Lucy Design, SuperSugarRayRay and more; an amazing DJ line-up: MoPo, M3, Dulce Vita, Shooey and Shissla; and a raffle for fabulous prizes including: Pioneer HDJ-2000 Headphones, limited edition gold Pioneer HDJ-1000 Headphones, gym membership to The Sports Club LA, personal training sessions, manicure/pedicure gift certificates to Sapphire Salon, massage therapy sessions, Clothing and Accessory items from all the designers and more. Everyone who has already made a donation will have free entry and receive a raffle ticket as well! Special thanks to all the DJs and companies/designers/proprietors who donated their services, goods and time. We really hope to bolster our fundraising efforts tomorrow…hope you can make it. GO TEAM TAMO! Lastly, I have some news on the music front. Ground_Control and I just dropped a hot new bootleg under our new alias, ICONtrol, on Soundcloud. “Rhythm is a Dancer” is one of my favorite dance music songs of all time and it was super fun to remix! I test-drove it like crazy on the Illeven Eleven West Coast tour recently and got ace reaction and feedback from the dancefloor and fellow DJ/producer types. Super stoked to share it. Instructions: 1. Listen 2. Download 3. Put bass face on. Check it! Also, the release date for our Deekline & Ed Solo remix of “Reload” featuring Million Dan will be June 18th on Rat Records. Get yours on Beatport! A Benefit to raise funds for research towards finding a cure for Crohn’s and Ulcerative Colitis Diseases. Please join us for an evening of local designers’ trunk show, awesome DJ’s, drinks & food, fabulous raffle prizes, and supporting a great cause! On June 24th, ICON is running the 13.1-mile Kona Half Marathon to benefit the Crohn’s and Colitis Foundation of America and also to honor Tamo, who is on the final road to recovery at long last. It’s estimated that 1 of 200 people have these diseases. All proceeds will go to CCFA; $0.75 of every dollar raised goes directly towards research for finding a cure and every major breakthrough has been funded by this organization! 251 Rhode Island St. @ 16th St.
Raffle Drawing will be held at 9pm, winner need not be present to win. We literally cannot wait the whole summer to hear the Dusty Rhino ROAR with her upgraded sound system…so we are are teaming up with the best sound in San Francisco yet again to let off some steam. Join the Dusty Rhino crew at Monarch on Friday, June 8th for deliciously dirty beats (see killer lineup below) and lots of love. For those who have made it out to the last couple of events, you know we will fill up so get your pre-sale tickets and come out early. (We will be reserving space for everyone with a presales this time). Discounted pre-sale tickets starting at $10 available here. $15 at the door if horny (i.e. work a horn in your attire), $20 hornless. All proceeds support the Dusty Rhino Art Car. 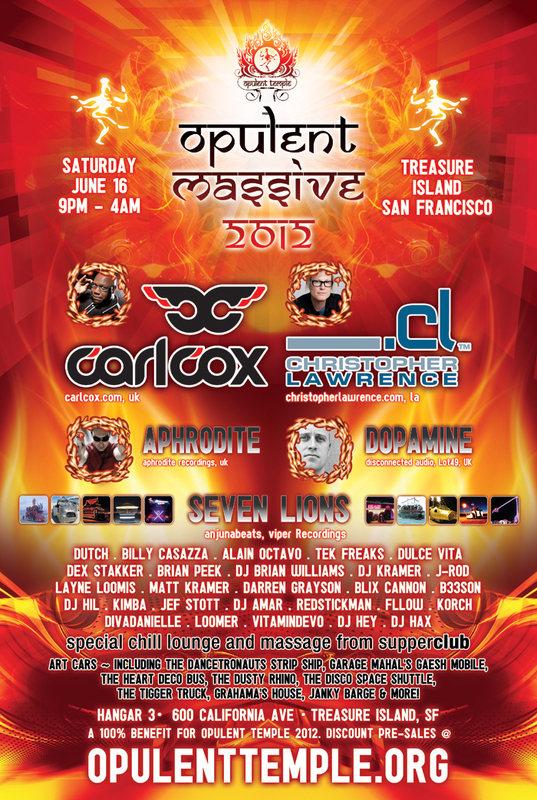 Opulent Temple returns to Treasure Island for our biggest off playa party -ever ! An electric night of music, art and community to help us go over the top on our 10 year camp at BM 2012. Art Cars ~ including the Dancetronauts Strip Ship, Garage Mahal’s Ganesh Mobile, the Heart Deco Bus, the Dusty Rhino, the Disco Space Shuttle, the Tigger Truck, GRAHAMa’s House, Janky Barge & More! Big Art ~ including APERION (by Charlie Gadeken), INFINITE PLAYGROUND (Kimba Rose), ELECTRIC DNA (Brian Krawitz), with more art by Rich Martin, Karen Cusolito, Vinkalmann, Debi Danger, Analogia, Rafael and MUCH more coming.